Click here to view full screen image. ALMOST 500 people from countries across the world – a record high - are currently seeking asylum in Northern Ireland. The fate of the 497 asylum seekers who are awaiting a decision on their future lies with the Home Office. The international crisis sparked by hundreds of thousands of refugees seeking new lives in the European Union has prompted a response from Stormont politicians. But while they have offered to help those displaced by conflict in countries like Syria, new research by Detail Data has revealed serious concerns around how asylum seekers are currently catered for. Campaigners have highlighted Stormont’s failure to introduce relevant legislation, including a long awaited Racial Equality Strategy and a Refugee Integration Strategy, while asylum seekers already based in Belfast have raised concerns over the handling of their cases. However, the Northern Ireland administration said the delayed legislation is at an advanced stage, while officials have started “significant preparatory work” related to the refugee crisis. All the major Stormont parties have supported efforts to house Syrian refugees with Deputy First Minister Martin McGuinness expressing hopes that 2,000 refugees could be placed in Northern Ireland, if Stormont responded appropriately. He said better support systems were required to overcome problems including language barriers, poor housing provision and the availability of specialist legal advice. Detail Data has extracted the Northern Ireland figures from Home Office immigration statistics which include quarterly figures on asylum, detention and removals. It shows that between April and June this year, 497 people from 37 different countries were seeking asylum in Northern Ireland including 154 applications from China and 14 from the war ravaged country of Syria. They are all living in houses, flats, hostels or B&Bs in Belfast – with the exception of one who is living in accommodation in North Down. Accommodation is provided on a “no choice” basis under the long-standing dispersal policy. The statistics made available to Detail Data cover only those asylum seekers who are judged to be ‘destitute’ and whose applications have not been finalised. The destitution test is that they do not have adequate accommodation or money to meet living expenses for themselves and any dependants within 14 days. Support is provided under Section 95 of the Immigration and Asylum Act 1999 to destitute asylum seekers until their asylum claim is finally determined. It can be provided as both accommodation and subsistence, or accommodation or subsistence only. Data on asylum seekers receiving financial support other than Section 95 is not broken down to UK regional level. Detail Data also requested information on asylum seekers from Northern Ireland's Department of Education, Health and Social Care Board, and the Business Services Organisation, an arm’s length body of the Department of Health, Social Services and Public Safety. 25 children who arrived into Northern Ireland unaccompanied between 2011 and August 2015 have been taken into care – the youngest was 12 years old – five were taken into care in the first eight months of this year alone. Countries the children had originated from included: Albania, Algeria, China, Egypt, Guinea Bissau, Iran, Romania, Somalia, South Korea and Sudan. 1,333 asylum seekers registered with a GP practice here between January 2010 and June 2015 – with 147 of them in the first six months of this year. Some of these people may be in receipt of Section 95 support. However, unaccompanied children cannot receive this financial assistance. The Home Office data also showed 212 people were detained at Larne House, Northern Ireland’s only holding centre for immigrants including asylum seekers between April and June 2015. However, the combined figures for Northern Ireland are low by comparison with the rest of the UK and Europe. It is not possible to calculate a total number of asylum seekers for the year as applications reported on in each quarter of the year can carry into subsequent quarters and even subsequent years. Children may also have been born to applicants since they arrived in Northern Ireland. Countries the refugees fled from include China (154 asylum applications), Nigeria (78), Somalia (58), Sudan (40), Zimbabwe (34), Algeria (14), Syria (14), Iran (13), South Africa (13) and Albania (6). The figure of 497 asylum seekers in one quarter is a record high for Northern Ireland, according to statistics that date back to 2004. In the same period in 2004 (April to June) there were just 132 people in receipt of Section 95 assistance. Successful asylum seekers are granted refugee status and five years limited leave to remain in the UK. The Home Office does not have a breakdown of these figures for Northern Ireland. The Department for Social Development (DSD) also said it does not hold figures on the number of refugees in Northern Ireland in receipt of benefits. If we assume that most applications should be dealt with within a year (the Home Office says it should take six months), we can attempt to pull together an estimated longer term picture. If we add up all the second quarter figures for every year since 2004, we can estimate that a total of 3,317 people have sought asylum here over that 12 year period. However, it should be noted that some applications actually take years to be processed. The statistics which are available are also limited. We do not know when the applications currently being considered were made. The Northern Ireland figures do not identify new applicants – instead the quarterly data relates to the total number of people (adults and dependants) in receipt of the main ‘Section 95’ financial support available to asylum seekers. As well as examining the latest figures, we are also reporting today on the stories of some asylum seekers living in Belfast. Most are receiving Section 95 support. The individuals, who are also being supported by NICRAS, have spoken about the difficulties they face living in Northern Ireland. One woman told us the asylum application process was “daunting”, “slow” and made her feel like “a criminal”. She is also relying on weekly food donations to feed her and her daughter. Click here to read more on these case studies. People who are already involved in the asylum process in Northern Ireland have raised issues about delays in the system, as well as concerns over language barriers, access to specialist legal advice, cuts in government support, poor quality accommodation and racism. Although the numbers seeking asylum in Northern Ireland are comparatively low, the system is already facing criticism over the provisions made for those who have sought refuge here. Justin Kouame, chair of NICRAS, told Detail Data that every day at least 20 people come through the doors of the organisation in need of assistance including food parcels. 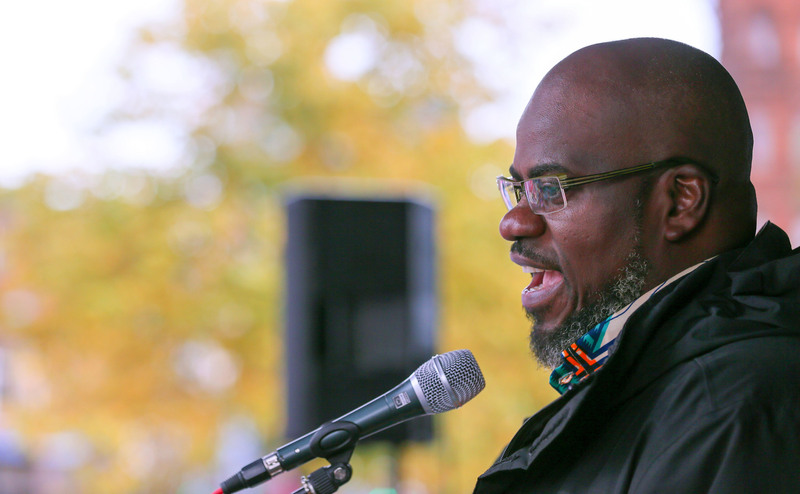 “The system does not care about any human aspect, it’s degrading,” he said. And he was also critical of the response from Stormont: “It’s an easy option to say it’s a reserved matter – for me it’s a lazy way. “The system here does not think asylum because it [Northern Ireland] is geographically isolated. Now more people coming here will put more pressure on the system. Politicians have yet to sign off on a long awaited Racial Equality Strategy for Northern Ireland, which could aid asylum seekers. It has been in development since 2007. Home Office figures show that of the 497 asylum seekers who were in receipt of Section 95 support at the end of June – just five were receiving subsistence only, which is usually given to those who are living with family or friends. That is a cash allowance of £36.95 per week per person. The allowance is topped up by £3 per week for a pregnant mother, £5 for a baby under one and £3 for a child aged 1-3 years old. The 492 asylum seekers living in dispersed accommodation were also in receipt of the cash allowance. The new standard rate of asylum cash support (£36.95 per person per week) took effect from August 10, 2015. This was a substantial reduction in support for single parents and families with children. Previously, asylum support had been paid at different rates, depending on the claimants’ ages and household compositions, for example a single parent with one child would have received £96.90 per week, but now they will receive £73.90. For comparison, people claiming a mainstream benefit such as income support are entitled to £114.85 per week for a couple (aged over 18) or £73.10 for a single person over 25. Asylum seekers in receipt of Section 95 support are also entitled to free healthcare, and education for children aged 5-17. Those people who are granted refugee status, humanitarian protection, or discretionary leave to remain in the UK will have the Section 95 support terminated 28 days later. They are then entitled to work and claim mainstream benefits. However, organisations including the Northern Ireland based Refugee and Asylum Forum have raised concerns that many people become destitute due to lengthy delays in the benefit system. This forces many to turn to voluntary and community organisations for support. 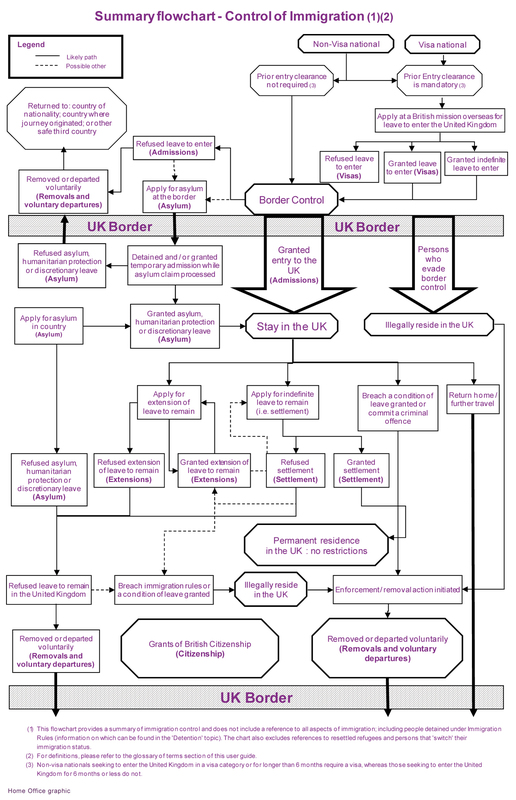 Immigration legislation is not a devolved matter and remains within the competence of Westminster, which means the Home Office makes provision in relation to the UK as a whole. However, Northern Ireland departments have responsibilities including health care, legal aid, English language courses and education. Meanwhile, the Home Office has also provided figures on the number of detainees being held for processing at Larne House in Co Antrim. This is Northern Ireland’s only holding centre for immigrants including recently arrived asylum seekers. Larne House, a former police station, can only accommodate 21 people for a period of up to seven days prior to their transfer to a long-term facility in Scotland, removal, deportation, or being granted temporary admission into Northern Ireland. The facility, which opened in July 2011, can also hold foreign nationals caught illegally working in Northern Ireland and those who have overstayed their visas. Prior to Larne House’s opening, detained asylum seekers were housed in Northern Ireland’s prisons. According to the latest statistics 212 people from 47 different countries were detained at the short-term holding facility between April and June 2015 – during that timeframe 46 were removed from the UK, 47 were granted conditional temporary release and the remainder were transferred to facilities elsewhere in the UK. The data does not make it clear if there is any overlap between the detainee and asylum seeker figures. For example, it is possible that a person could be detained for a short time and then released and given Section 95 support. Detainees were predominantly from China (34), Pakistan (32), Bangladesh (11), Nigeria (11) and Albania (10). Three detainees held between April and June were from Syria. The Middle Eastern country has been ripped apart by conflict since 2011 claiming the lives of more than 240,000 people. There are approximately 1.2 million Syrian refugees living in the neighbouring country of Jordan and hundreds of thousands more have fled to Europe. Horrifying images of the lifeless body of a three-year-old Syrian boy, Alan Kurdi, washed up on a Turkish beach on September 9th sparked global outrage. His is one of more than 2,500 lives that have been lost in the Mediterranean this year. WHAT IS NORTHERN IRELAND DOING? Prime Minister David Cameron has promised to resettle up to 20,000 people from Syrian refugee camps in the UK over the next five years. The Assembly has unanimously endorsed a motion calling on the Executive to ensure provisions are in place for Northern Ireland to welcome refugees from Syria. Alliance MLA Anna Lo said: “The Prime Minister recently announced that the UK would accept 20,000 Syrian refugees over five years, but 4,000 refugees a year is not enough. Responding to questions from Detail Data, a spokesperson from the Office of the First and Deputy First Minister (OFMDFM) said: “Officials have begun significant preparatory work to ensure that we are in a position to respond effectively to the needs of refugees in Northern Ireland and two groups have been set up to take this work forward. “A Strategic Planning Group led by OFMDFM has been established to coordinate the response of Executive departments and agencies and to consider the strategic issues and local implications. An operational group led by DSD will consider and address the practical steps that will be needed to meet the immediate and longer term needs of those who may arrive. The refugee crisis has again put the spotlight on OFMDFM’s delayed Racial Equality Strategy 2014-2024, which should provide a framework for government departments to tackle racial inequalities and to promote and encourage good race relations and social cohesion. Although it was put out to consultation in June 2014 with the consultation closing in October 2014 - proposals for the final strategy are still being developed. A recommendation by the Northern Ireland Strategic Migration Partnership in November 2013 for a separate Refugee Integration Strategy has not yet been acted upon by OFMFDM. Northern Ireland is the only region in the UK and Ireland without such a strategy. The OFMDFM spokesperson added: “Ministers have considered and commented on a draft strategy that takes account of the consultation responses. This is being circulated to other Executive Departments before consideration by the Executive for final agreement and publication. In March 2014, ministers also agreed to establish a Crisis Fund, which was administered by the Red Cross between January and April 2015. It is intended to help relevant individuals including refugees and asylum seekers with no other means of support through emergency situations. OFMDFM told Detail Data the process of tendering for the 2015-16 Crisis Fund, which has a budget of £100,000, will begin shortly. HOW DOES NI COMPARE TO THE REST OF THE UK AND EUROPE? Across the UK, 30,457 people were supported under Section 95 (April to June 2015). Broken down by region the figures are: England (24,791), Wales (2,355), Scotland (2,649) and Northern Ireland (497). In comparison during the same timeframe 228,600 asylum applications were lodged across Europe by people from 141 countries – the majority from Syria, Afghanistan and Albania. Six countries received 80% of all European first time asylum applications. They were: Germany (80,900), Hungary (32,700), Austria (17,400), Italy (14,900), France (14,700) and Sweden (14,300). To view the datasets mentioned in the article go to http://data.nicva.org/dataset/asylum-seekers-northern-ireland. According to this data 212 people were detained at Larne House, Northern Ireland’s only holding centre for immigrants including asylum seekers between April and June 2015. 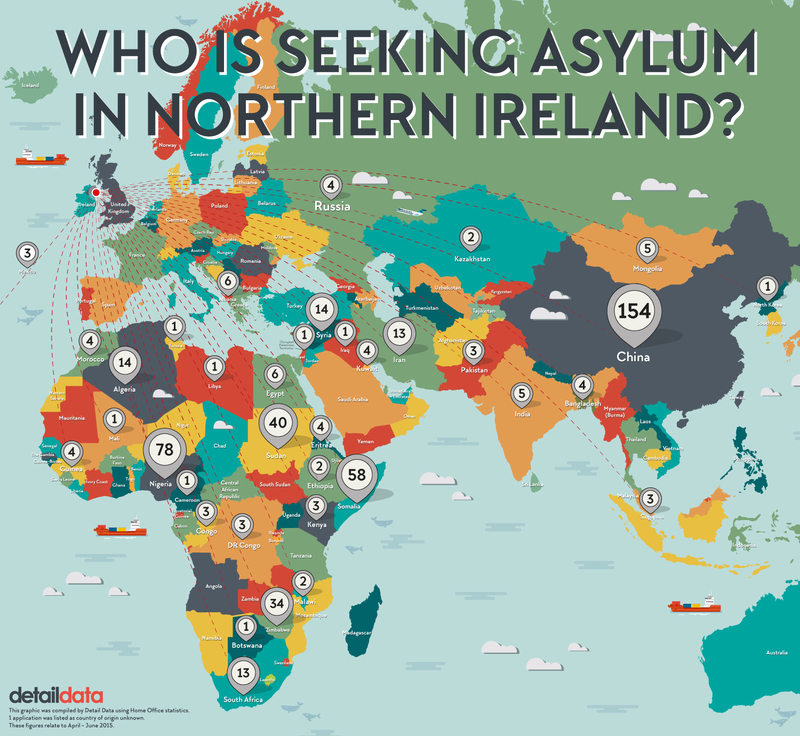 It shows that between April and June this year, people from 37 different countries were seeking asylum in Northern Ireland including 154 applications from China and 14 from the war ravaged country of Syria. Detail Data also requested information on asylum seekers from the Department of Education, Health and Social Care Board and the Business Services Organisation, an arm’s length body of the Department of Health, Social Services and Public Safety.